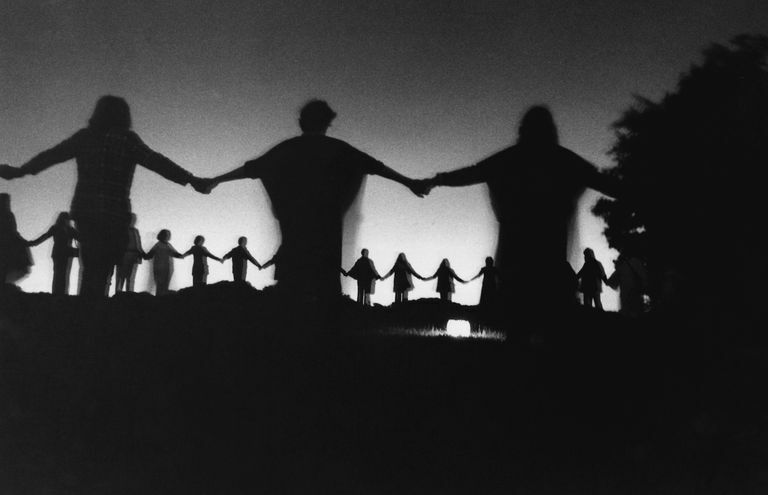 Begin by casting a circle, if your tradition requires it. Prior to starting the ceremony, place three sheaves of corn or wheat around the ritual space. You'll also need a statue or other image of the God and of the Goddess at the center of your altar. Around the statues, place five candles -- red and black to represent the dark aspect of the Goddess, green and brown to symbolize the wild God, and white for the hearth and home. Place a plate of dark bread, enough for each person present, near the center of the altar, along with a cup of wine or cider. Circle the altar. The youngest person present will act as the Handmaiden, and the oldest as the High Priest (HP) or High Priestess (HPs). If you're performing this rite as a solitary, simply take on both parts. Once all offerings have been made, and thanks given, take a moment to meditate on the new beginnings of Samhain. Consider the gifts that the gods have given you over the past year, and think about how you might show them your gratitude in the coming twelve months. As the old year dies, make room in the new year for new things in your life. You may not know yet what's coming, but you can certainly imagine, dream and hope. Tonight, this night between the worlds ​is the perfect time to imagine what things may come. Decorate your altar with symbols of the God -- antlers, acorns, pine cones, phallic symbols -- and representations of the Goddess, such as red flowers, cups, pomegranates, etc.